You can measure the effectiveness of your email marketing campaign with CRM. More than just watching individual email campaigns, you need to measure how your email marketing is performing over time. If your messages are getting more or less effective, you want to know and take action. After you understand how your email marketing drives revenue, use your knowledge to predict when your emails create action from your contacts. Because your CRM is tied directly to your email marketing system, you can analyze your database and see which demographics bought more from you. If you know men over the age of 50 performed well in a campaign, look at the design and ascertain why. You can use this knowledge for future campaigns. 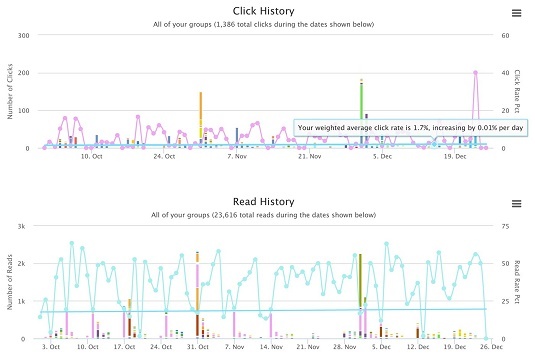 When you look at overall performance, you’re accumulating a lot of data from what your contacts do with the emails you send them. Watching read and click rates over a prolonged period tells you whether you’re hitting the mark on a holistic level. 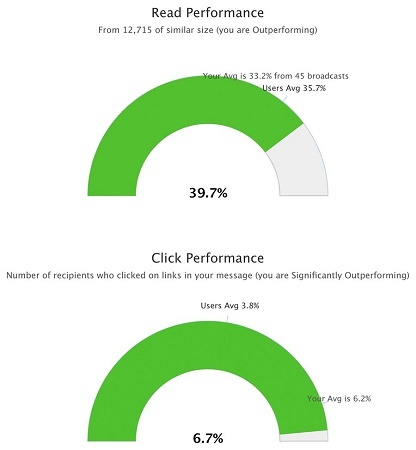 Reads and clicks are the best indicators of interest in your large-scale email communication. When you measure this data, you need to average the daily variations and see how you’re doing as a whole. You need to undergo statistical analysis to understand true long-term performance. To accurately measure long-term email marketing effectiveness, take your daily volume into consideration and do some data smoothing. It prevents small volume days and statistical noise from skewing your results. With good statistical modeling, you can see whether people are taking more interest in your messages and whether you’re getting better at convincing them to engage with your emails. Below is a summary of reads and clicks over a three-month span. Daily reads and clicks have variations, because during low volume days, email sent is triggered by workflows. Automatic email has a lower overall effect on total read and click rates, however, because it does represent much less volume. Trending reads and clicks over time. One common question involves whether a client’s read, click, or bounce rates are “good.” The answer is always “it depends,” much to the frustration of the person asking. Many studies have been published over the years, with differing statistics available based on industry, list size, and email frequency. What I’ve found is that list size is the strongest driver of email interaction. This statistic isn’t much of a surprise, as larger lists are often associated with less personal, less meaningful relationships between the brand and the individual. Your email service provider or CRM vendor should provide you with benchmarks you can use to compare your performance against similar clients. Industry benchmarks are a good indicator of your effectiveness compared to others in your market. Read and click benchmarks for a broadcast. Conversion tracking requires your CRM to track people all the way from when they received your email to the conversion itself. You can tag links in your email with campaign IDs, which can then track back to your individual campaigns. You may also consider using a CRM that does this segmentation for you automatically.